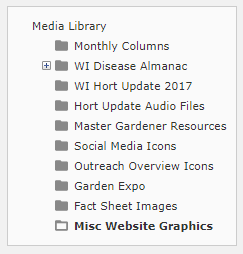 Go to the Media Library by clicking Media on the WordPress Admin Dashboard menu (at the left). The Media Library screen appears. To create a new folder, click the blue Create Folder button. Note: the folders don’t display in alpha order and can’t be sorted – this is a limitation of the plugin. Due to the difficulties with drag and drop, you may not want to nest folders (create folders within folders). Rename the folder and click OK. The dialogue box closes. Click OK. The dialogue box closes. This plugin works by drag and drop. Each monitor only has so much vertical space, and monitors with limited vertical space will require scrolling, which complicates drag and drop. Increase vertical space – The bigger your monitor, the better. Filing will be harder if you try it on a laptop. Shrink the text size of the page in the browser – press Control and – to shrink the browser screen. You can do this multiple times. Adjust list items per page – in the upper right, Screen Options will let you adjust the number of entries show per page. Click the three dots and drag them up to the top and hold them over the black horizontal toolbar, that will auto-scroll the screen (be careful with this, and do it with a mouse, not a touchpad). This can be tricky until you get used to it – practice to get more comfortable. The folder you are currently in appears in bold. You can only use the folder for moving between folders; you cannot drag files onto or into it. To return to the main Media Library, don’t click the back button of your browser. Let go of the mouse button, and the screen blinks as it moves the file into the folder. Click the checkboxes to the left of the file icons for the files you want to move. Tip: You can select all the files on the page by clicking the checkbox next to the File column header to select all items on the page, then individually de-select any files you want to omit by clicking their check boxes. Continue dragging the files until you reach the destination folder. The destination folder changes to show a blue border around it. Note: If you select and move all the files on the page, you will need to click the Refresh button on your browser to see the next page of results. Click the three dots and drag them over the Back folder. The destination folder changes to show a blue border around it.